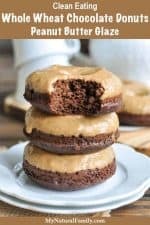 This whole wheat chocolate donut recipe with peanut butter glaze is a healthy and delicious treat or breakfast.They are made with whole grains, no refined sugar, no oil, no butter, and taste divine! Did any of you play the donut on a string game at Halloween parties as little kids? I remember playing it and I remember the donuts always being plain, glazed donuts. I don’t know why, but I have never liked glazed donuts, so as a kid, I didn’t have much motivation to play the donut game. However, if it would have been a chocolate donut or really any kind of donut with real frosting on it, I would have been all over the donut game. Which is still the case; glazed donuts don’t do much for me, but any other type of donut can be hard to resist. Next time you have a Halloween party and want to play the donut games, try it with these donuts…or just make them for yourself because you deserve a little bit of chocolate in your life. I would love to know if you remember the donut game and if you try these donuts. Did you put the frosting on or just eat them as plain, chocolate donuts? Please comment below. Dip the cooled donuts in the glaze and enjoy! Can I using regular sugar instead coconut sugar ? I don’t think they will keep their shape as cookies, but you could try them as cupcakes or mini loafs. Could you use Almond flour or coconut flour instead?